The D5100’s viewfinder is bright and functional, with a large removable eyepiece and dioptre correction. With coverage of just 95% of the full image, however, it places the camera firmly towards the entry-level camp (the D7000 offers 100% coverage). Coupled with a magnification of just 0.78x, the viewfinder image appears rather small with a tunnel-like view down the eyepiece. The alternative is to use the live view functionality of the 3in, 921,000-dot LCD. Not only is it large and resolute, but it is also mounted on a vari-angle bracket to the side so it can be tilted through 180° horizontally and 270° vertically. The benefit of having the mount to the side is that the LCD can be angled for viewing in front of the camera and used when the camera is mounted on a tripod. A downside is that having the screen not in line with the lens makes adjusting the composition trickier. 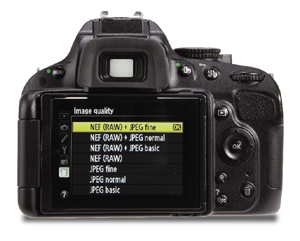 Live view provides 100% coverage for framing and the single-point AF can be taken right to the edges of the frame. The face priority and full-time servo options are also handy, especially for video. The move to QuickTime format video was the right one for Nikon and the quality of the clips on the D5100 is testament to that. Recorded in full HD (1920×1080 pixels) at a choice of 30, 25 or 24fps, the recordings are smooth and detailed, and provide high-quality playback even on large HD screens. For creative users, the only downside is that the exposure controls are fully automatic.